What are your favorite organic food and natural body care brands? Santa Cruz Organics? Annie’s macaroni and cheese? LaraBars? Burt’s Bees? Did you know that all these products are owned by larger companies that have historically had no interest in organic foods and natural products? A few weeks ago my new favorite sustainable living website featured a great article about natural brands of food and body care that are owned by larger, not-so-natural companies. Katherine Manchester has written a great article titled 12 “Natural” Brands, Owned by Giant Corporations on Groundswell, and I think it’s so important to share and expand on her ideas here. The story is that smaller, independent, natural, and organic food companies are being bought up swiftly by larger companies like Coca-Cola, Nestle and General Mills (among others) in order to diversify their product lines and consolidate the industry. There are good and bad outcomes of this. If you’ve never seen the chart that shows brand consolidation, now is the time. The report, published here by the Cornucopia Institute, shows how the different brands interrelate. Scary or exciting? Who owns organic? For a full size, downloadable version, click here. There can be some positives in these buyouts: it increases the availability of organics by lowering prices, improving exposure in markets including Wal-Mart, Costco and other high-volume stores. In a speech at ShiftCon, Robyn O’Brien said that the recent $820 million buyout of Annie’s brand, makers of organic bunny-shaped macaroni and cheese, is an opportunity to support these smaller brands and support the values that we strive for: organic, natural and non-GMO. If we abandon them now, all the work this small company has put into building a healthier model for mac and cheese will have been for naught. Supporting them– and supporting a larger company that might have fundamentally different values than many of their customers– shows that we WANT organics, and we NEED them to be more available. The downside to some of these brand consolidations is that it allows the larger brands to make good on meeting customer demands while still selling mostly processed, unhealthy foods. It means that customers that support, for example, organic Annie’s mac and cheese, are then indirectly supporting products like Lucky Charms, Fruit roll-ups and Yoplait– products that contain GMOs, are highly processed, and are generally linked to the increase of bad health in the United States. As Manchester notes in her article, the other downside is that these buyouts might affect the quality of the original brand. She notes examples of this in which Cornucopia Institute called out brands for changing their ingredient lists after being acquired. She lists inclusion of GMO grains and pesticide residues in Kashi cereal; the chemical carageenan in Tom’s of Maine toothpaste; and inorganic manufacturing processes in Silk soymilk, among others. “Boycotting these brands is not necessarily the solution. Many remain independently run and committed to their founding principles. The last message that we as consumers want to send to corporations is that we don’t care about the products we buy or the people who make them. 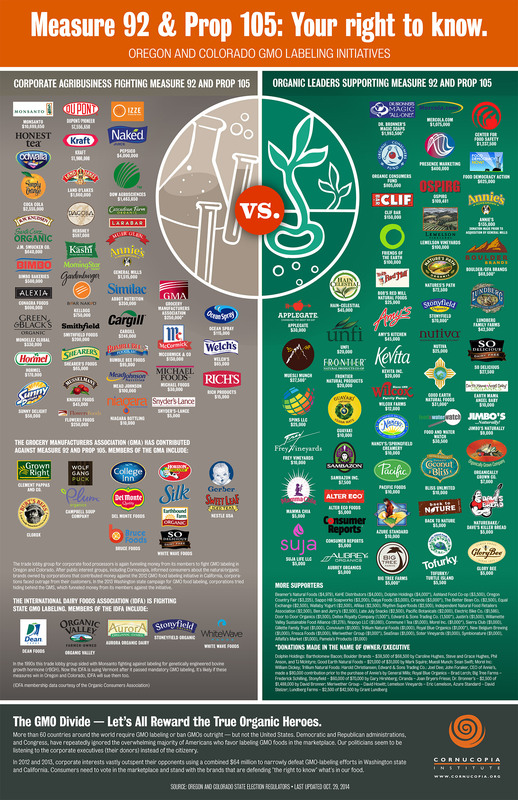 Research your favorite brands, starting with the ‘Who Owns Organic’ infographic above. If they have a corporate connection that you don’t agree with, write and tell them!